I was fortunate to attend a photography workshop last week with the theme of Cities and Xerox. 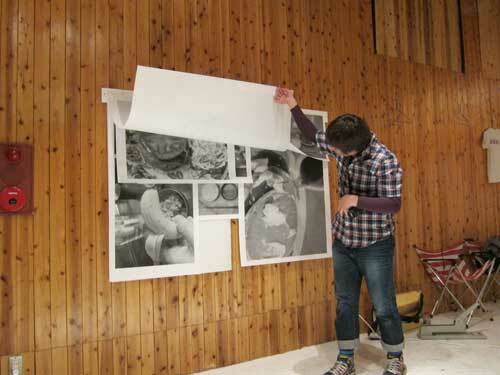 The event gathered about twenty Japanese creatives– including a sound engineer, high school art teacher, students, guidebook writer, book editor, lawyer, and salaryman– and together we created giant photographs layered together. It’s great to see other people’s photographs and see how they view Tokyo. I was particularly struck by the breakfast images: everything from a traditional Japanese breakfast (many courses, including fish, rice, miso soup, pickles, etc) to a Denny’s, coffee, and those odd, squeezable jelly drinks in foil that are popular in Japan yet seem more suited to outer space. I was the only foreigner, but felt very welcomed by the organizers and participants. The workshop was led by accomplished photographer Hirano Taro, who became famous for taking photographs of empty pools in California used by skateboarders. 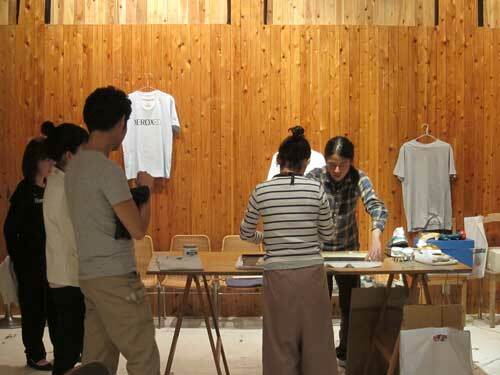 The workshop took place at Vacant art space in Harajuku as part of a series of Romantic Geography events created by Too Much Magazine’s Tsujimura Yoshi. You can see our photographs through May 22 at Vacant. There are also coffee and beeswax events coming up. I had a fantastic time, and was very impressed with how accessible, fun and collaborative this event was. Art provides a beautiful way to invite the smallest and least cute wildlife into our lives. I want this bug home! Art is a valuable way to help us invite nature into our lives. And insects, often ignored by city dwellers, are bottom-of-the-food-chain and critical for supporting a variety of wildlife and plant life. I like how Lisa talks about the importance of expanding our “tolerance” for wildlife that may not immediately appeal to us. Last weekend I went to Suwa in Nagano with Kobayashi sensei of Sinajina for the famous, once every six years onbashira festival. Over two months, the residents of Suwa select enormous trees growing on top of the mountain ridge, cut them and transport them down the hills by dragging them with rope, race down a hill sitting on the logs, and eventually lift them up at several important shrines (while people stand on top of them, I guess, to make it more difficult, heavy and dangerous). Onbashira is a very pleasant mix of animism, forestry and virility. More on the ceremony later. But, first, the first joy of taking any trip in Japan is buying a bento at the station. There is an incredible variety, priced from about 500 yen to 1,500 yen. Each comes beautifully wrapped in a box, with fantastic graphic design. You can see some cool typography, artistic mountains and trains, a space shuttle, a pokemon, and cherry blossoms. I chose the spring special, decorated with sakura petals. Inside I was delighted to find over twenty different foods, including takenoko (bamboo shoots). Even more remarkable, my box came with a photo and description of the organic rice farmers. And lastly here’s the purple-striped beauty that got us to the Suwa lake in just two hours from Shinjuku. The San Francisco Chronice published an interesting article about how San Francisco is offering developer incentives to turn empty lots into temporary green spaces: potted trees, thirteen foot tall miscanthus grasses that capture carbon, artists’ spaces, and a garden tended by homeless. Could this be a green solution to the Great Recession’s impact on real estate development, replacing blight with food, habitat, and public spaces? My artist and product design friend Pierre Alex, whom I blogged about earlier, created this funny “anti-design” video about Tokyo’s most famous rail line, the Yamanote that circles central Tokyo. The idea is that it’s a single train in perpetual motion. How is this relevant to Tokyo Green Space? An extraordinary transit system is a basic requirement for a sustainable city that values public transit over private vehicles, and shared spaces over individual or members-only spaces. Tokyo’s transit system is truly the best in the world, for the area it covers, frequency of trains, cleanliness, on-time performance, and safety. A fast, comfortable and convenient transit system is a place where all social groups intersect, and is the backbone of a walkable city. No matter where I travel in Tokyo, I am always amazed at how many friends I bump into. I also believe that artistic visions are necessary for us to imagine and create post-industrial cities that are creative, desirable and serving human aspirations. Plus, the video is cool. La Yamanote, c’est le mur d’enceinte version société industrielle. La ligne de train circulaire entoure la ville et la protège de sa banlieue. Mais comme me le disait Raphaël, dont j’aime les trëmas sur le prénom, c’est aussi Zazie dans le métro. On se paye un ticket pour un petit tour d’une heure à regarder la ville. C’est l’hiver, les sièges sont chauffés, il y a même la télé. On peut voir le golf, ou un cours d’anglais. Mais c’est souvent de la pub. Il y en a une, pour la bière suntory, où tout est en noir et blanc sauf les boissons. Chaque fois que je la vois, j’ai soif. Ca tombe bien, la yamanote est une ligne aérienne, comme la ligne 2 à Paris vers Stalingrad. Et quand on sort, entre Kanda et Ueno, on trouve sous les arcades les bars les moins chers de Tokyo. 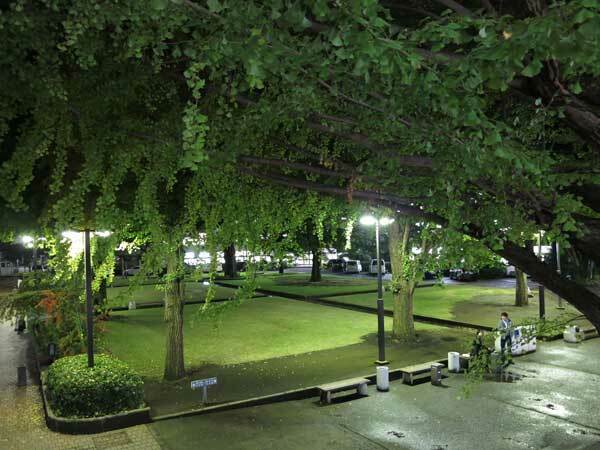 Under the title “Trolls in the Park,” there is an outdoor public art display in Suginami’s Zenpukuji park: a quiet park with two ponds, many ducks and wonderful mature trees now turning colors. If you have a chance to attend before November 22, I recommend a visit. It was late in the day, and my photos turned out blurry. Above is Matthew in front of a manga-inspired sign, one of a series that blends the natural world of the park with the narratives and scene-shaping of comic books. Below is one of a series of birdhouses with men’s ties. Much better photos are available on the Art in the Park website. There’s also a funny blog (in Japanese) by the artist Toshiaki Tomita who calls himself a bad guide who doesn’t know anything about the park. Below is a photo of fall foliage, reason enough to visit the park. The idea of temporary art in the park– enlivening nature with culture and vice versa– appears to be gaining international interest. 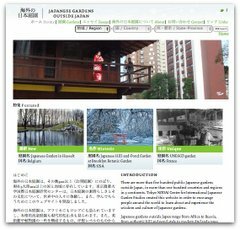 This Tokyo event has many British artists, and I read about a similar event in Singapore (through December 27 in the Singapore Botanic Gardens). In spring the sustainability director of ARUP showed me the incredible designs for Inujima Art Project, and I had known immediately that I wanted to visit and see it for myself. In an earlier post, I discussed its zero energy use through a creative natural cooling, heating and lighting system, and its wastewater recycling program. Also listed was the the architecture by Sambuichi Hiroshi, art by Yanagi Yukinori using elements from Mishima Yukio’s house and writings, and the benefactor Fukutake Soichiro, Benesse‘s owner and the creator of nearby Naoshima, another island in the Seto Inland Sea. Visiting Inujima on a beautiful fall day in October and spending the night in a school house closed many years ago and converted into a hostel was an incredible experience combining nature, recent history, art, and questions about Japan’s industrial past and its 21st century future. Inujima in the early 20th century was a small island with over 3,000 inhabitants in the early 20th century. In a brief period of ten years, Inujima was the site of a massive seirenshou, or copper refinery, placed in the Seto Inland Sea to keep the intense pollution away from Japan’s population centers. With the collapse of copper prices after only ten years, the refinery closed and the island entered a long period of decline. Today there are approximately 50 residents, with an average age of 70 or more. The chimney built just before the refinery closed now serves as an integral part of the zero emissions temperature system in the new museum structure. Earlier chimneys had less structural integrity, and large parts of the refinery, including its original power station, are now being reclaimed by thick forest. After the jump, a discussion of the art work and the island today. Diane Durston of the Portland Japanese Garden invited me last week to visit the Nezu Museum, which recently reopened. The art collection of scrolls and screens representing nature from the fourteenth century are stunning, as is the new building designed by Kuma Kengo is a wonderful example of “wafu modern” (和風モダン), a modernization of traditional Japanese design. But mostly I was drawn outside to the large garden. The winding paths and unexpected size make you feel far from Aoyama. Although just outside the main exhibit hall, the garden is marred by the sight of the strangely tall and also squat Roppongi Hiills Tower, once inside the garden it is a fantasy of forest punctuated by old tea houses, streams and ponds. The garden has been revived yet retains a look of simplicity and wildness. Originally it formed part of the home of the museum founder Nezu Kaichiro, the Tobu Railway president and industrialist who was a collector of pre-modern Japanese and Asian art. Perhaps even better than Kuma Kengo’s main exhibit hall is his modern take on the Japanese tea house. The new cafe is incredibly light and airy, opening out on to the garden and with an interesting ceiling light that looks like illuminated stone. Since our visit last Friday, the weather has turned much cooler, especially at night. The next few weeks will have wonderful fall foliage in the garden.